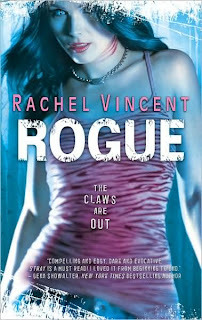 Faythe Sanders is back in Rogue, Rachel Vincent's sophomore offering and follow-up to her debut novel Stray. DH was the one who came across Stray and recommended it to me. We both enjoyed it and were looking forward to reading the sequel. Vincent has a contract for six total Werecat books and so there is plenty of time for character and world development. Which is a good thing because, while Faythe doesn't bother me as much as she seems to bother other readers, she definitely has some hurdles to tackle in the way of maturity, particularly when it comes to relationships. I do find myself sympathizing rather more than is my norm with the various men in her life, be they father, brothers, or boyfriends. At the same time, I'm also willing to cut her a fair bit of slack given her status as one of only a handful of female werecats, the only daughter of a domineering alpha, and the recipient of about ten times her fair share of male ego. I guess I just understand her longing for independence. Especially after she worked so hard to get an education, only to be snatched back to the pride against her will. In Rogue, Faythe and her on-again off-again boyfriend Marc are working to track down a rogue were who's been killing strays in their territory. Soon the murders grow to include a series of seemingly unconnected exotic dancers, the only common denominator being that they each look just like Faythe. Straight dark hair, green eyes. Cuh-reepy. In the meantime, Faythe and Marc have enough on their hands handling each other, let alone the increasing pile of dead bodies. But when the trail leads back to someone from Faythe's past she thought she'd left behind, all hell breaks loose and Faythe is left scrambling to keep her friends and prove her innocence. I liked the pace of this one. It moved along at a good clip and the mystery was involving. I still like Faythe's scruffy brothers and her parents' relationship remains touching, if slightly eerie. I'm anxious (and a little bit afraid) to see where Vincent plans on taking Faythe next. She seems to be floundering quite spectacularly and I really sort of hope she (and Marc) will be able to pull their explosive emotions (and reactions) together long enough to be up front about their differences and find some middle ground. I think they both need to grow up, though Faythe's immaturity is more frequently on display than Marc's, and until something forces them to really see each other for who they are and accept what they see, things will continue to be rough for these two cats.